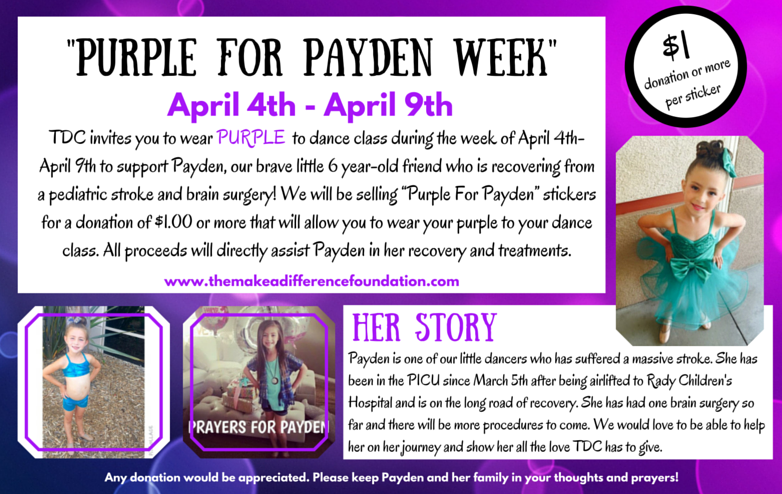 Make A Difference Foundation and Temecula Dance Company are hosting “Purple For Payden” Week during April 4th-April 9th at all three TDC locations!! Payden is a 6 year old dancer who’s been dancing at TDC since she was 2 years old. Back in early March she suffered from a massive stroke and was airlifted to Rady Children’s Hospital. Since then she has undergone several brain surgeries and is fighting to get on her road to recovery. This little girl is a fighter. She has remained strong through the ups and downs at Children’s and is not giving up. Payden has been at Radys since March 4th and will remain there until things get better. Her parents have been staying at the Ronald McDonald house never leaving her side. 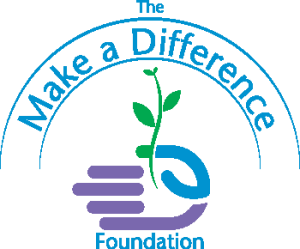 Temecula Dance Company and Make A Difference are hosting this week long event to help raise funds to offset the countless medical expenses the family will have to endure. 100% of the proceeds from this event will be given directly to Payden’s family, so every dollar counts. 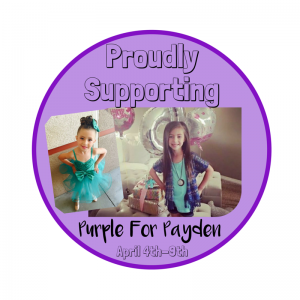 All three TDC studios will be selling Purple For Payden stickers April 4th-April 9th to all the dancers wanting to support Payden. The stickers are only a $1 donation or more if you wish. Let’s show Payden how much love and support she has from her TDC family and please keep her and her family in your thoughts and prayers!